The Spafford Town Board is discussing a Finger Lakes Land Trust plan to buy 205 acres from the Burns family on Route 41 to create hiking trails at the southern end of Skaneateles Lake. The town board must make sure the plan conforms to local zoning laws enacted in 2010 and a state environmental review. The board was to discuss the plan Thursday night and a public hearing on the project will likely be held in mid-August, said town Supervisor Webb Stevens. Zepp is hopeful the town will approve the project soon and that the trust can buy the land within two months. The Burns family will continue to farm the rest of the 600 acres they own nearby, he said. The majority of the land is located on the west side of Route 41 near a scenic overlook. About five acres on the east side of the road will be part of a 4,000 foot-long corridor that will connect the property to the Ripley Hill Nature Preserve, a 130-acre preserve owned by the Central New York Land Trust. The Finger Lakes Land Trust plans to demolish an abandoned house on the property, build a 12-car parking lot, build interpretive kiosks and create a 1.5 mile loop trail over the more rugged sections of the property, Zepp said. A second trail of a little more than a mile would be built to connect the property to Ripley Hill, he said. The Finger Lakes Land Trust has acquired a 68-acre property that includes 390 feet of undeveloped shoreline on the east side of Canandaigua Lake in the town of Middlesex, Yates County. The property adjoins Bare Hill—a scenic landmark that rises more than 800 feet above the lake. The parcel, formerly owned by Beverly Reed and her brother, Charles, was sold to the Land Trust at significantly less than its appraised fair market value. The Land Trust launched a fund-raising campaign earlier this spring to help pay for the acquisition of the property as well as its maintenance and upkeep. The project is part of the Land Trust’s ongoing regional capital campaign that seeks to raise $5 million to protect undeveloped shoreline, sensitive stream corridors and other lands important to water quality, wildlife habitat and scenic views. To date, the Land Trust has raised 85 percent of the goal. The Reed acquisition consists of separate tax parcels and includes two single family homes, which will be sold. The Land Trust’s conservation plan for the property includes creating public accessibility to the lake for low-impact uses such as kayaking, hiking, and bird watching. This latest project will be the Land Trust’s third acquisition on Bare Hill. In December, the organization acquired 13 acres adjacent to the entrance to Bare Hill State Unique Area. In 2007, the group partnered with the Town of Gorham and the NYS Department of Environmental Conservation to acquire 96 acres of woodland bordering East Lake Road across from the Rushville water plant. Elsewhere within the Canandaigua Lake Watershed, the Land Trust has acquired land and conservation easements to secure scenic farmland in the Town of Canandaigua, rugged gorges in the Towns of Naples and Italy, and woodlands bordering the West River and High Tor Wildlife Management Area. 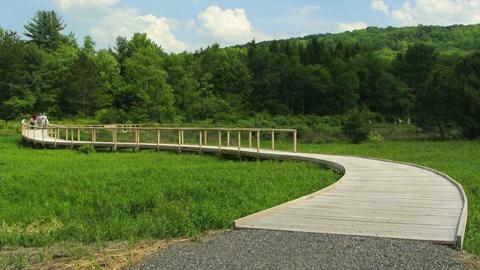 NEW Emerald Necklace boardwalk in Dresden NY. They call it the Emerald Necklace, a belt of green connecting 50,000 acres of public and preserved land in an arc around Ithaca, from the Finger Lakes National Forest near Trumansburg in the west to near the Dryden village limits in the east. And on Friday, the Finger Lakes Land Trust held a grand opening for the first link of the dreamed-of greenbelt. The Ithaca-based nonprofit bought 169 acres along Irish Settlement Road, between Hammond Hill State Forest to the north and its own Roy H. Park Preserve to the south, in November 2010. The site also abuts the Cornell Plantations’ Slaterville 600 natural area. Together, the lands comprise 7,500 acres of publicly accessible and preserved wooded and open space. There are bigger parts, such as the Connecticut Hill State Wildlife Management area in Newfield. But the site celebrated Friday is the first link the Land Trust has built. It was able to act quickly when the property came on the market because of donations from an array of individuals, businesses and organizations, Executive Director Andrew Zepp said at an informal ribbon-cutting ceremony. Also speaking: Ken Lynch, regional director of the state Department of Environmental Conservation, who said the land is an example of the kind of links the state is beginning to aim for; Tompkins County Legislature Chairwoman Martha Robertson, D-Dryden, whom Zepp thanked as an individual conservationist and in her role with the county, which provided grants through its open-space and tourism-promotion programs; and Mary Ann Sumner, supervisor of the Town of Dryden. This past winter, the Land Trust built a hiking trail linked to the 20-mile multi-use trail network in Hammond Hill. The Land Trust also acquired land across Irish Settlement Road from the Park Preserve that it plans to deed to the state as an expansion of Yellow Barn State Forest, Zepp said, and it may one day be possible to hike across all of them into a preserve along Ellis Hollow Creek Road. Zepp also announced memorials at the site. The trail and boardwalk will be named “Howard’s Walk” after Howard Hartnett, an active conservationist who recently died. An educational kiosk at the entrance will be named in honor of Ed Thompson, an Ithaca native whose siblings James, Bill, Mark and Ellen Fowler contributed in his honor. The overlook will be named in honor of Matthew Ruppert, whose family has supported the Land Trust. The Finger Lakes Land Trust launched an effort to create a greenbelt of undeveloped lands that will ultimately extend around the southern half of Skaneateles Lake, ensuring the integrity of the area’s scenic landscapes and also helping to maintain Skaneateles’ and the city of Syracuse’s drinking water supply. The project was launched with the recent donation of a conservation easement on 31 acres of mature woodland overlooking the lake by landowners John and Robin Hinchcliff. The Land Trust has also successfully negotiated a contract to purchase 200 adjacent acres from Bill and Leonard Burns. Both properties are located in the town of Spafford. The Hinchcliff conservation easement ensures that a steep, forested hillside overlooking Skaneateles Lake will remain undeveloped. The property includes frontage on Randall Gulf Creek – a significant tributary to the Lake. Conservation easements are legal agreements that limit future development while allowing land to remain in private ownership, and on the tax rolls. shore. The property features scenic views of the Lake and includes several rugged gorges, and half of Randall’s Gulf – a large ravine that extends to the lakeshore. The acquisition also includes a 4,000 foot corridor that links the larger parcel to the nearby Ripley Hill Nature Preserve, which is owned by the Central New York Land Trust. The property is located near the Land Trust’s 130-acre High Vista Nature Preserve. Once acquired, the Land Trust intends to develop a network of hiking trails on the land along with a parking area, scenic overlook, and on-site interpretation of the land’s natural and agricultural history. A $1 million fundraising goal has been set for the project to cover the cost of acquisition, as well as site improvements, and long-term management. Skaneateles Lake. Recreational resources include the extensive multi-use trails for Bear Swamp State Forest, popular Carpenter’s Falls and undeveloped shoreline that is enjoyed by residents and visitors alike. 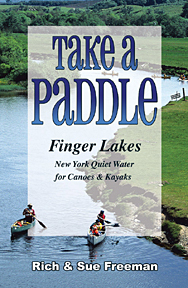 To hike, bike, or explore waterfalls mentioned here, pick up guidebooks from Footprint Press. The Land Trust identified the parcel as a priority for protection due to its location near the summit of the hill and next to the primary entrance to the State Unique Area. The organization intends to sell the property to the State as an addition to the Unique Area at some point in the future when funds are available. The property is entirely forested with a mix of oak-hickory forest and planted conifers. Bare Hill is well known in the area as the scenic ridge that rises 865 feet above Canandaigua Lake’s eastern shore just north of Vine Valley. Old photos show that the area was indeed “bare” in the past but today it is largely forested, except for its summit which is covered with a mix of meadows and shrub lands. One Seneca legend has it that the writhing of a great serpent swept the hill of its trees and bushes until it was bare. Whatever the cause, Bare Hill is notable for its shallow soils that are susceptible to drought stress most summers. The Land Trust was able to take advantage of this opportunity through a generous donation of funds from an anonymous donor who cares deeply about the future of Canandaigua Lake and its surrounding rural landscapes. This is the second project the Land Trust has completed at Bare Hill. In 2007, the organization worked in partnership with the Town of Gorham and the NYS Department of Environmental Conservation to acquire a 95-acre parcel on Bare Hill’s northern flank. Elsewhere in the Canandaigua Lake Watershed, the Land Trust worked with partners to complete five other land protection projects during 2012: the protection of two farms in Canandaigua and a hillside meadow in South Bristol through the use of conservation easements (perpetual legal agreements that limit development while allowing the land to remain in private ownership); the acquisition of streamside wetlands in partnership with the Town of Canandaigua, and the acquisition of a 32-acre addition to the organization’s Great Hill Nature Preserve in the Town of Italy, Yates County. There’s something about taking a walk in the woods – something that brings out a peaceful feeling in a person. Maybe it’s the elimination of the bustle of everyday life. Maybe it’s the beautiful views of vegetation and wildlife. Maybe it’s the cathedral-like canopy of the treetops towering above one’s head. For whatever reasons the woods bring calmness, they can all be found at the Stevenson Forest Preserve. 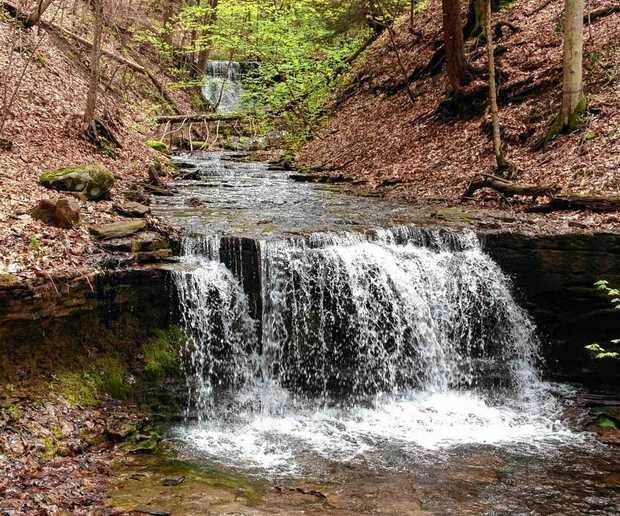 Located just outside Ithaca in Enfield, this Finger Lakes Land Trust’s protected land encompasses 83 acres, featuring a trail slightly more than a mile long. The pathways to chose from include a section of the Finger Lakes Trail and the Stevenson Trail. Following that path takes one along a stream on the left, winding the way alongside a hilly incline to the right. A kiosk with a logbook and information about the Finger Lakes trail, including maps and tips, sits a short way into the woods. The trail continues until it abruptly butts up against posted private property. A large log provides ample sitting room with a look at a rocky section of the stream, as well as a manmade grouping of large rocks. The steepest section of the trail commences here, as it takes a 90-degree turn to the right, leading straight up the hill. This is where the path becomes less dirt covered, turning into a carpet of needles and leaves, unspoiled from the winter season because of the dense umbrella of leaves in the tall trees populating this section of the preserve. The suggestion here would be to take the Stevenson Trail, if only for what is found at the end of the path. Taking the blue route, the trail becomes almost moguled and covered with tree roots jutting out, then evens out into a nice pathway again as one walks through the trees, these are much smaller and clearly less mature than the titans encountered during the first part of the hike. The sunlight that is quite muted, save for glimpses of sky, during the Finger Lakes Trail section, grows brighter as the trail nears the edge of the woods. Leaving the woods, tall grasses line the path for a short distance, and then the path enters a small wooded section. Almost as quickly, the wooded area ends and a breathtaking view appears, with tall grass stretching for miles, distant communities visible on the far-off hills. It’s well worth the hike to see the sight, and a bench – marked in loving memory for Martha W. Baldwin (1924-2006) and Peter E. Costich (1925-2005), with the logo of Troop 4 Eagle from Ithaca and the Finger Lakes Land Trust – offers a nice, high-backed place to sit. According to the Finger Lakes Land Trust, the original 25 acres of the preserve were owned by the Stevenson family of Enfield dating back to just after the Revolutionary War. Thirty-four years ago, the land was inherited by Elizabeth Stevenson Bennett, who later opted to donate it to the Finger Lakes Land Trust after being approached by Michael DeMunn, a consulting forester for the Finger Lakes Land Trust at the time, and FLLT volunteer Betsy Darlington, who currently serves as the organization’s stewardship advisor. The original 25 acres became the first section of the preserve in 1995; later additions of property in 1998 and 1999 increased the acreage to 83 acres. Those additions came thanks to Percy Browning, who bought land to donate it and added 18 acres to the total, and anonymous grant that paved the way for the acquisition of 40 more acres. Among the vegetation visible in the preserve, according to the FLLT, are Indian cucumber-root, Jack-in-the-pulpit, starflower and horse balm. There also are several ponds in the preserve; the migration of spotted salamanders can be seen in early spring and wood frogs also may be spotted breeding in the ponds. For more information about the Stevenson Forest Preserve, visit the Finger Lakes Land Trust website at fllt.org and look under the Protected Lands section. Directions from Ithaca: Take Route 13 South to Route 327 North. Follow Route 327 N, and then take a left on Trumbull Corners Road. The parking area for the Stevenson Forest Preserve is about a half mile down the road on the right. 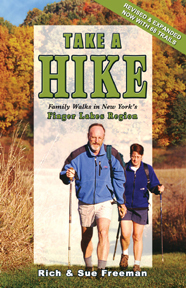 For many places to hike in the Ithaca NY area, pick up a copy of the guidebookTake A Hike – Family Walks in New York’s Finger Lakes Region.